Still spinning for Tour de Fleece. This batch is about 3/4 done - and I'm looking forward to moving on to something else. 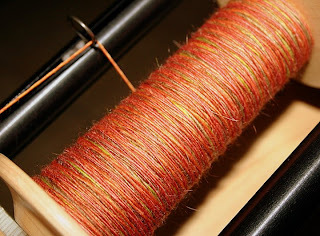 Love the colors, especially the oranges; not crazy about the merino in the blend. I've also started another woven felted shawl using the same colors as yesterday's. I want to try different weft spacing to see if I get a more open effect. Saw Harry Potter this afternoon - disappointed! Marie and I thought there was too much time spent on the various romances and not enough on the primary plot of the book. It's a shame since we were both really looking forward to the movie.